If life’s a shoot … memories are the movie. 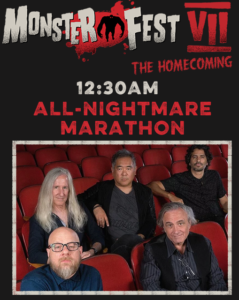 I’m back home after the US premiere of Nightmare Cinema, reflecting on the highpoints of the trip and ready to consign the rest (long security lines, delayed flights, rush-hour connection in the city that never sleeps) to memory’s cutting-room floor. If life is the shoot, then memories are the movie … and tonight it’s all about the final cut. EXT. NEW YORK CITY STREET – NIGHT. Producer Mick Garris and Artistic Designer Lauran Fitzsimmons walk toward Cineopolis — site of the New York City Horror Film Festival, and the US Premiere of Nightmare Cinema. They’re accompanied by Laura Power, host of Behind the Scenes, a podcast that recently featured an interview with Mick Garris. I’m there as well — the point-of-view guy, the memory cam. Mick, Laura, and I have already seen the final cut of Nightmare Cinema. (Indeed, Mick has screened it a half-dozen times at various international events). But Lauren has yet to see the final cut, which makes this an exciting night. You see, it was Lauran who helped give each of the film’s five segments its distinctive look by transforming found locations into nightmarish sets. 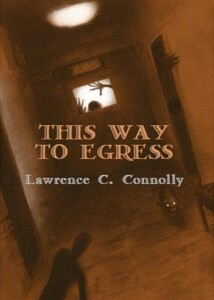 Jason Zerrillo’s cover for the Ash-Tree Press edition of the collection This Way to Egress. FLASHBACK: The “Egress” set in 2016. 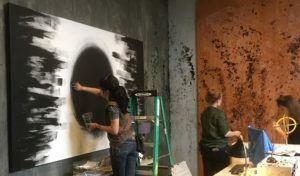 Lauren and her team apply fake mold and synthetic blood to walls, furniture, and floors of an L.A. office, creating a set that will bear an uncanny resemblance to the cover art of the book This Way to Egress. Lauren Fitzsimmons and her design team transform an office in downtown LA. BACK TO SCENE: We reach the silver facade of Cineopolis Chelsea, six stories high, a beacon os silver light. The screening is well attended; the audience, enthusiastic. After the show, Festival Programmer Tony Timpone moderates a Q&A with Mick Garris. Mick talks about the international scope of Nightmare Cinema, how it features the work of horror masters from Cuba, Japan, England, and Mexico. Should Nightmare Cinema become a series (as he hopes it will) future installments will build on that international concept, fulfilling a dream that Mick first developed when his series Masters of Horror completed its run on Showtime in 2007. CUT TO POST-SHOW RECEPTION: The place is packed with cinephiles, screenwriters, directors, producers. 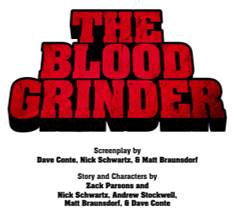 Among the screenwriters are Nick Schwartz, Dave Conte, and Matt Braunsdorf — the team behind The Blood Grinder, a finalist in the festival’s script competition. Directors and producers include Kevin and Jennifer Slunder (whose short film Heartless will go on to win the festival’s Audience-Choice Award) and Jennifer Stang (whose short The Whistler will be named Best Short). Reviews coming soon. Sharing the red carpet with Lauren Fitzsimmons, Jennifer Slunder, and Kevin Slunder. 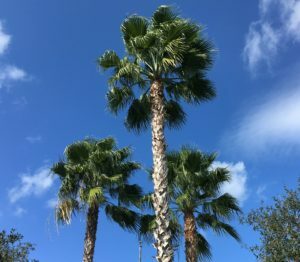 CODA: After New York, I head south for a family event in Florida, getting a day to exchange the skyscrapers of chilly Manhattan for the sunny palms of Orlando. And then … back home. That’s where I am now, replaying the events in memory’s theatre – that private screening room where the dull stuff gets edited out and the fun stuff gets all the close-ups. Yeah … it was a good time! Until next the next shoot … scop on! It’s the summer of 1977. I’m crashing at my brother Mark’s apartment at Hotel Chelsea, dreaming of following in the footsteps of other writers who used that iconic landmark as their home base in New York City. 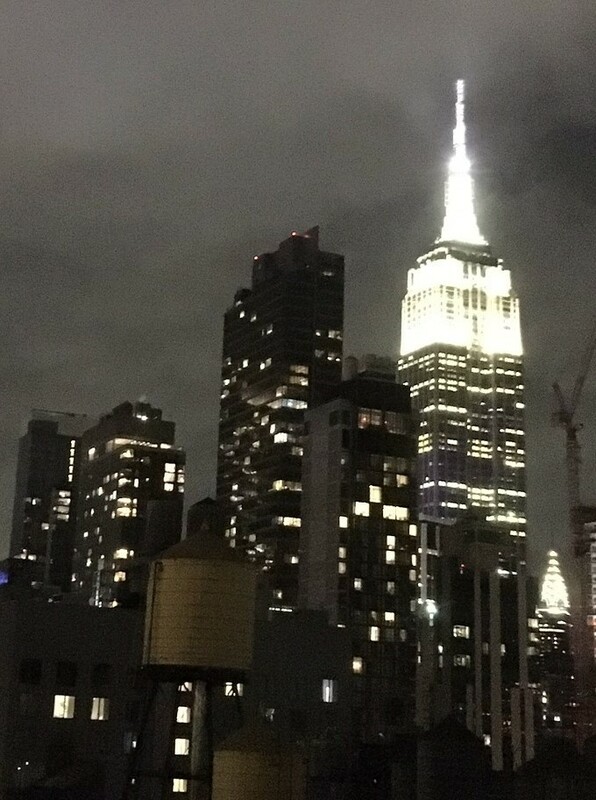 It’s the place where Arthur C. Clark worked on 2001: a Space Odyssey, where Alan Ginsburg revolutionized American poetry, and where Dylan Thomas drew his final breath. It’s also where Nancy Spungen (girlfriend of Sid Vicious) was found stabbed to death. But that was a little later. For me, in the summer of 1977, it was a great place to launch some writerly dreams. (Above) Hotel Chelsea, back in the day. 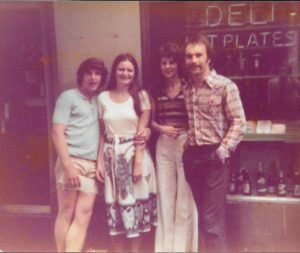 (Right) Brother Mark and the 21st Century Scop with significant others in front of the Aristocrat Deli, next door to Hotel Chelsea, 1977. 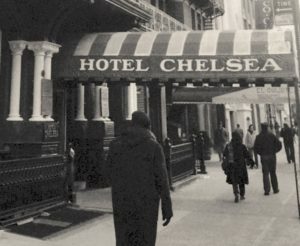 Then, as now, Hotel Chelsea is flanked by the Aristocrat Deli on one side and a theatre on the other. But although the deli is the same, the theatre has changed. 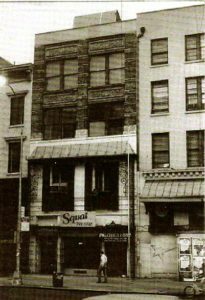 Back then, it was a performance space called the Squat Theatre – an experimental venue frequented by the likes of Andy Warhol and Nico. 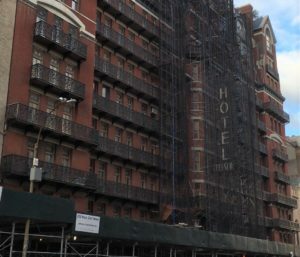 Today, Hotel Chelsea is cover in scaffolding, its distinctive red-and-white canopy (a newer version of the one shown above) hidden in a cavern of interlocking metal beams as the building undergoes a long-overdue renovation that began in 2016. Work is expected to continue into next year. 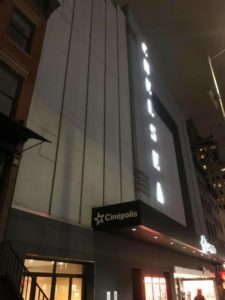 The Aristocrat Deli is much as before, but Squat Theatre is gone, replaced by the gleaming facade of Cineopopolis Chelsea, a massive movie theatre that later this evening will host the US premiere of Nightmare Cinema. (Above) Hotel Chelsea under renovation. (Right) Squat Theatre at 256 West 23rd, as it looked shortly after its opening in 1977. 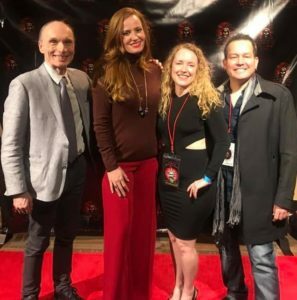 Today’s screening of Nightmare Cinema is part of the New York City Horror Film Festival, where I’ll soon be joining Producer-Director Mick Garris and Artistic Director Lauren Fitzsimmons for the opening-night event. Also on hand will be filmmaker Nick Schwartz (who is currently developing an adaptation of my story “Prime Time!”). Nick will be joined by Dave Conte and Matt Braunsdorf. Their script The Blood Grinder is a finalist in the festival’s scrip competition. It should be an exciting night. 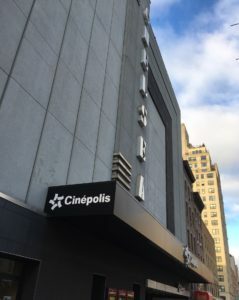 Cineopolis Chelsea, on the site formerly occupied by Squat Theatre. Nightmare Cinema screens this evening at 7:00 PM. This will be your chance to see it before its general release to theatres and streaming in early 2019. If you’re in town, I’ll hope to see you there. Also on the bill tonight is “Inked,” a short film by director Kyra Gardner. I’ll post some updates soon. Until then … scop on! 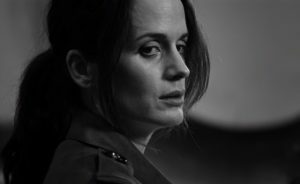 Taking a final lap in its tour of the world’s top genre film festivals, Nightmare Cinema is now racing toward its long-awaited US Premiere. Earlier this month, the film finished its circuit of the UK with a screening at The Leeds International Film Festival, the film went on to play at El Festival de Cine Fantástico on the Canary Islands, where Producer-Director Mick Garris received the Festival’s del Premio Isla Calavera de Honor Award, a skull designed by special effects master Colin Arthur (The NeverEnding Story). From there, our film headed to the Land Down Under for its Australian Premiere at Monster Fest VII, where it received an enthusiastic reception at Cinema Nova. Next up: New York City and a US Premiere at The New York City Horror Film Festival, where I’ll be joining Mick Garris at a Thursday night screening at Cinepolis Chelsea. I’ll be posting reports from the scene next week. Until then, I’ll leave you with links to some more Nightmare Cinema’s reviews. The first is one that I missed when it came out at the end of summer. The others are from the Leeds and Melbourne screenings. As in my previous posts, the quotes are followed by links to the entire review. 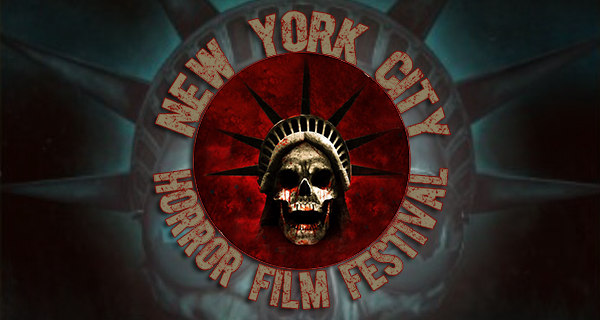 New Your City Horror Film Festival logo. 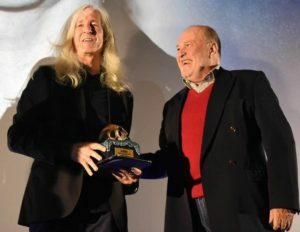 Mick Garris receives del Premio Isla Calavera de Honor at El Festival de Cine Fantástico‘s official opening gala, Multicines Tenerife, Canary Islands. Cover page of The Blood Grinder by Dave Conte, Nick Schwartz, & Matt Braunsdorf. Nightmare Cinema poster from Monster Fest VII. A couple of interesting links this week. The first arrived a few days ago from G. Brandon Hill, Executive Director of Acquisitions and Distribution at Good Deed Entertainment. 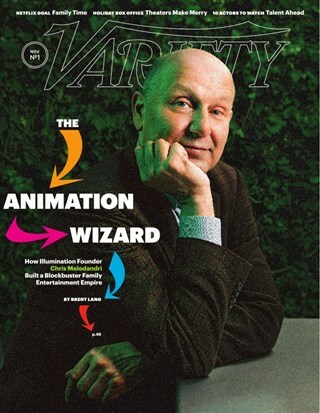 It’s a link to an exclusive piece in Variety that includes the long-awaited details about Nightmare Cinema’s release. Cranked Up Films has partnered with AMC Network’s streaming platform Shudder to buy North American distribution rights to Cinelou Films’ Nightmare Cinema. Although not mentioned in the article, I have it on good authority that a release to physical media (DVD and Blu-Ray) is also in the cards. You can read the complete article here. Also of interest is a post at the blog-site of World-Fantasy-Award nominee Michael Liebling, in which he considers how “Traumatic Descent” became Nightmare Cinema‘s “This Way to Egress.” You can read Michael’s account of the story’s dramatic ascent here. And finally, I’ll leave you with a video in which Joe Dante talks about his contribution to Nightmare Cinema. The interview was shot last summer at Fantasia Fest, but the video was just posted this week. It presents an interesting overview of the anthology format and some insightful comments on the changing face of cinema. Powered by WordPress and delivered in 0.330 seconds using 46 queries.